Dubai: Musicians playing instruments that range from oud, sax and guitar, as well as one-man bands and innovative artistes, Metro Music Festival is all set to enthral commuters from today, March 17. Free to attend, the week-long festival runs till March 23. It features 25 international artistes and offer Dubai Metro riders something to hum about. The festival, being held across five metro stations — DMCC, Dubai Mall, Mall of the Emirates, Union and Burjuman — will have back-to-back performances during morning and evening peak hours. Shaima Al Suwaidi, City Branding Manager, Brand Dubai, told Gulf News: “The artists have not performed before in the region and they will present unique art forms and instruments made of unusual material such as vessels, glasses etc. The idea of bringing them here is to celebrate creativity, talent and innovation, while bringing different cultures together,” added Al Suwaidi. The festival, to be held across five metro stations — DMCC, Dubai Mall, Mall of the Emirates, Union and burjuman — will have back to back performances during morning and evening peak hours. Hailing from different parts of the world, the line-up of performers include Glass Bottle Xylophone player Fedor Grigorev from Russia, One-Man Band from India, Italian PorcaPizza who plays instruments made from recycled items as well as Aleksander Lemeshev from Russia who plays glass harp, an instrument made out of drinking glasses. Some local and regional artists will also perform at the festival. 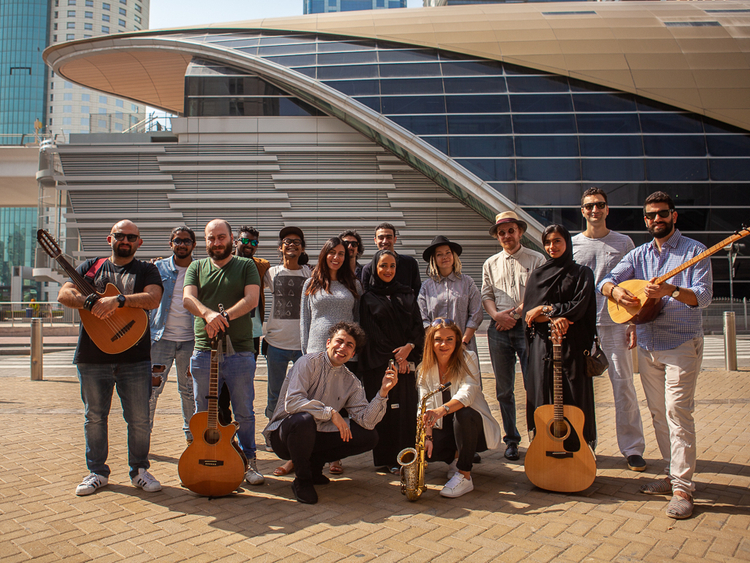 Among them are Emirati guitarist Khadija Salem, Jordanian Hand Pan performer Kdun Ebrahim Allbaz, Syrian Qanun player Rami Kanjou and Saudi Arabian melodica player Taher Al Bahrani. The morning session will be held from 6am to 12 noon, while the evening gig will be played from 4pm to 9pm, with all artists taking turns to perform at different stations. Organised by Brand Dubai, the creative arm of the Government of Dubai Media Office, in association with the Roads and Transport Authority (RTA), the festival aims to be a celebration of the spirit of Dubai. “This is the celebration of global art and culture. It is a celebration of the people of Dubai, who hail from all parts of the world and there is no better way to connect people than through music,” said Shaima. Rizal is a multi-instrumentalist, folk singer, songwriter, instrument builder and social activist from West Java, based in Ubud, Bali. He has dedicated his music and career towards creating social change and promoting creativity. Rizal developed the Rasendriya, which combines guitar with didgeridoo and celempung (percussion). Further exploring the use of bamboo for instruments, Rizal’s latest project is his Bamboo Lapsteel Guitar and Strings instrument. In late 2012, Rizal made waves on the international music scene. He has toured Australia twice and performed at many international festivals. Recently, Rizal was chosen as a ‘Global Youth Hero 2018’ by Global Youth Leaders. A musician from the city of Padang Panjang, West Sumatra Province, Indonesia, Agung plays the talempong, a traditional Indonesian instrument. Gladson Samuel Peter is an international singer/songwriter from Mumbai and a multi-instrumentalist who plays more than 45 musical instruments. Gladson has appeared on various popular TV shows such as India's Got Talent and The Kapil Sharma Show. Besides, he performs in more than 200 shows every year. In his One Man Band setup, he plays various instruments such as the guitar, kazoo, harmonica, bass drum, snare drum, cymbals and some others - all at the same time. Talia Lahoud is a 16-year-old singer and guitarist born in Lebanon. She started out on social media at an early age as a cover artist on YouTube. Today, she has thousands of followers on social media. Fedor Grigorev is a street musician from Russia. He lives with his family in St. Petersburg, but visits Helsinki on weekends and holidays to perform. Earlier in his life, Fedor worked as a rock musician, an assistant camera man and a clown in a small theatre. Simone Concas is a harmonica beat-boxer from Sardinia, Italy. The development of his unique style is the result of a lifetime of musical influences. After a year of experimentation in beatbox-harmonica, electronic music and the didgeridoo, he began performing his first live gigs in Cagliari in 2011. This started with him attending open mic sessions, and went on to him participating in the initiative known as “Busking Cagliari”. In February 2016, Moses decided to participate at the Italy’s Got Talent auditions in Rome, and after several challenges he won the first prize of the TV Show, becoming known in Italy as “The Miracle Harmonica". His albums include I Wanna Breathe (2014), Cannonau (2015) and Cannonau Spirits (2016). Massimo Tortella, born and raised in north Italy, is a singer and multi-instrumentalist who plays the electric and classical guitar, bass guitar, drums/percussion and a producer. Porcapizza, the one-man-band-recycled-music-show, designed and assembled by Massimo is a mixture of music, art and entertainment. This one-man-band features several instruments created out of recycled objects such as a tennis racket, an old typing machine and telephone. Alexander Lemeshev is one of the most famous artists playing on the glass harp, not only in Russia, but across the world. Earlier in his life, he worked as a bass player in a rock band and a jazz band. Since 2002, he has been professionally engaged in playing the glass harp. The artist has toured many cities in Russia and repeatedly demonstrated his skills abroad in Italy, Germany, Finland, France, India, Mexico, USA and other countries. He has performed at cultural events including concerts and festivals of maestro Yuri Bashmet, the Petrovsky Ball in Venice, the International Glass Music Festival in the USA, the opening of the film festival Amur Fall in Blagoveshchensk, the White Nights Festival in Perm, a concert in the cultural programme Days of St. Petersburg in Arkhangelsk, a concert in honor of Elena Obraztsova, and the closing ceremony of the Paralympics in Sochi. Alexander is a member of the international association of glass music, Glass Music International. Michael Gorecki is a 24-year-old Polish musician who plays the pan flute, a musical instrument consisting of multiple pipes of gradually increasing length. Michael has performed at concerts mainly in Poland, Germany and Spain. He loves to play old musical pieces like “Lonely Shepherd”, “El Condor Pasa”, and “The Last of the Mohicans” apart from “Despacito”. Born In Amritsar, Punjab, child prodigy Suleiman started playing the bansuri, a side blown flute originating from India, at the age of three. He started capturing the attention of music lovers while performing at the age of 5. He first came into the national limelight when he won the Indian classical music talent show NAAD-BHED in 2014. Subsequently, in 2016, he captured the nation's heart when he was declared the winner of the reality TV talent show India’s Got Talent. With his prize money, he could afford to relocate with his family from Punjab to Mumbai to stay close to his teacher, the renowned musician Pandit Hariprasad Chaurasia. Suleiman has participated in many concerts in India and abroad, where he performs both Indian classical as well as light classical music. He has been awarded several prestigious national awards. Matias Arce is an actor and puppeteer. He graduated from the Provincial School of Theater of Santa Fé. His training included the manipulation, construction and interpretation in puppet theater, with diverse techniques and materials, among them gloves, rods, marots and yarn puppets. In 2007 he founded the independent puppet group "Hasta las Manos", performing two shows: "Delirios de Seduccion", which premiered in 2009, and "El Dueño del Cuento" by Silvina Reinaudi, which premiered in 2013. From 2009 to 2012, he was part of the Municipal Puppet Theatre‘s cast. Since 2013, he has been living in São Paulo and is part of the cast of the show “Paquitos Cueca Cuela” performed by the group comprising of Pambazos Bros, Cumbia Calavera and Pipo y su Sabor. Bobby Valchev is a singer, pianist, trumpetist and composer. A graduate of the National Music Academy-Sofia, he has performed at festivals in Italy, Spain, France, Germany and Poland. Although he has had a classical music education, jazz is the music that best speaks to him. Bobby has been a Musical director and pianist of the original project of Claude J.Woods (Earth Wind and Fire experience). He has performed at many jazz festivals in Europe. He was an assistant professor of the world famous Milcho Leviev. Bobby has also been 'jammin it' with world famous jazzmen such as the multi-Grammy Award winning musician George Benson, bassist Marcus Miller and jazz drummer Billy Cobham. Since 2008, Valchev has been living and working in London. In 2011 he relocated to Dubai where he has performed at many corporate and social events. In 2014, he performed at the Dubai jazz festival on the main stage as a support band of Earth, Wind and Fire. In 2016 he had three performances at the Dubai jazz festival. In 2017 he also performed at the Dubai Jazz Garden festival. Adam Kadabra is not your everyday acoustic player. He uses a technique called “Lap Tapping” in which he rests the guitar on his lap and powerfully taps the frets and strings to create a captivating cacophony. He created this style after a small accident that fractured one of his fingers, which made it difficult for him to play the guitar in a normal way. Addicted to drumming, this percussionist from Belaruswho plays the bongos has been performing on stages across the globe for the past five years. Currently based in Dubai, she is a top DJ in various venues. Based in Dubai for the last two years, Aksana Laukava plays the saxophone. Over the last 15 years, she has performed in various venues across the world. Emirati Khadija started playing the piano three years ago when her uncle bought her a keyboard. A self-taught player of the piano and the melodica machine, also known as the "graphica", Taher Jafar Albahrani has performed at several musical events in Saudi Arabia. He learned to play the piano on YouTube. Events he has participated in include five local musical evenings in the Kingdom of Saudi Arabia, local festivals such as King Abdelaziz Cultural Centre (Ithra), an event at the American University of Toledo, Ohio on the occasion of the National Day of the Kingdom of Saudi Arabia, and an event in the German consulate in Riyadh. He was a semi-finalist in the third season of Arabs Got Talent. Medhat Mamdouh is a young Egyptian musician who became famous for creating a new musical style combining the recorder with beatboxing. Medhat was a semifinalist in Arabs Got Talent, an Arab reality television talent show broadcast by MBC. His video received over 10 million views, making it one of the top 20 videos in the world. He also won the first place in Nokia Free Style Show. He has performed at concerts on a tour to Austria, the Formula One in Abu Dhabi, a BMW event in Germany, the La Perle show in Dubai and various events in Egypt. Khaldun Albaz is musical performer based in Dubai. As a self-taught drummer and percussionist, he is passionate about exploring new rhythms and melodies. In 2011 he discovered the hang drum. He is the first in the world to create a new genre of music on the hang drum which integrates modern styles and rhythms with culturally themed melodies on both traditional and contemporary instruments. Khaldun’s latest musical endeavor reflects his collaboration with musicians from more than 13 countries, invited or residing in Dubai where his ambitious global project has culminated in the album ‘City Vibes’. Omar Hamdan is a professional musician, classical/electric guitarist, Oud player and a certified trainer. With a musical background that includes diverse genres, he has performed with different bands from different styles. He currently performs as a solo artist and also accompanies singers and bands. Omar started playing guitar 16 years ago. He has been trained by professional international trainers. He also composes and produces music for singers, short movies and commercials and produces electronic fusion music (Fusion House music). Habib Khalil is a popular accordion player from Lebanon. The instrument got his attention in early childhood while watching cartoons. His neighbour who was also a music teacher started teaching him how to play. After learning the instrument, he went deeper into folk, tango, waltz and polka. He currently performs all over the world, playing music and creating memories. Talia Lahoud is a 16-year-old singer and guitarist born in Lebanon. She started out on social media at an early age as a cover artist on YouTube. Today, she has thousands of followers on social media. Currently, she performs at weddings, festivals, and other events as a solo female performer. Born in Aleppo in 1988, Rami Kanjou is a well-known player of the Qanun in the Middle East. The qanun is a traditional Middle Eastern stringed instrument. The qānūn is the only musical instrument in the oriental takht (traditional Arabic ensemble) that can play all the notes of Arabic scales on open strings. The rest of the ensemble depends on the qānūn for setting the pitch and tuning. It is not only regarded as one of the central instruments in the traditional Arabic ensemble, but also the equivalent of the piano according to texts in early 20th century Arab music theory.